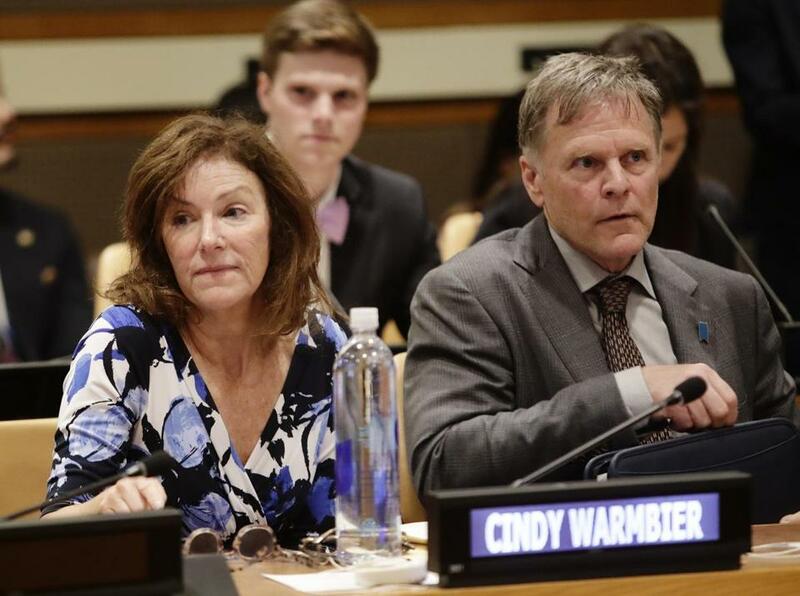 Cindy and Fred Warmbier, whose son Otto died after being jailed in North Korea. But on Tuesday, after a five-hour summit with leader Kim Jong Un, Trump showed up for a triumphant news conference in front of hundreds of international journalists and didn’t mention human rights in his opening remarks. The issue wasn’t included in a joint statement signed by the two leaders. And although Trump, in response to a question, assured reporters that he raised the matter with Kim, the president did not offer anything specific about what they discussed. Even his characterization of North Korea as a brutal dictatorship had grown more equivocal after meeting its 34-year-old leader. During his speech in Seoul, Trump had called conditions in the rogue nation ‘‘a hell that no person deserves.’’ At the State of the Union address, Trump surprised his audience by hailing the bravery of a North Korean defector seated in first lady Melania Trump’s box, an emotional moment that drew a standing ovation in the House chambers. The president’s muted tone on human rights came as he suggested that, by engaging in a dialogue, Kim had put his country on a path toward peace and prosperity. The outcome of Trump’s summit drew backlash from his political opponents. ‘‘Kim’s gulags, public executions, planned starvation, are legitimized on the world stage,’’ Senator Chris Murphy, Democrat of Connecticut, wrote on Twitter, adding that Trump gave up too much to Kim by agreeing to end military exercises between the United States and South Korea. Trump said more working-level meetings among aides would begin soon as the two sides hammer out details on how to move forward over denuclearization talks. But he made no mention of trying to win commitments from Kim to release political prisoners or close the hard labor camps to which an estimated 100,000 North Koreans have been sentenced. Ultimately, Trump said, imprisoned North Koreans are ‘‘going to be one of the great winners, as a group.’’ But he did not explain why he felt so confident. Trump’s shift in tone is particularly remarkable given that it was after the death, one year ago Wednesday, of Otto Warmbier, a University of Virginia student who had been held captive in North Korea for 17 months on false charges, that the president had appeared to take a harder line on Pyongyang last year. Aides said Trump, who has prided himself on helping win the release of 17 Americans from foreign jails, was personally moved by Warmbier’s story. The president has offered personal support to Warmbier’s parents, Fred and Cindy, including calling them several weeks ago. The family has filed a federal lawsuit against North Korea for having ‘‘brutally tortured and murdered’’ Otto, a move made legally possible when Trump ordered North Korea returned to the list of state sponsors of terrorism. Fred and Cindy Warmbier said in a statement on Tuesday that they appreciated the president’s comments. They said they were hopeful that something positive could come from the summit.